Vern, a professionally trained and certified therapy dog, joined our practice in July 2015. 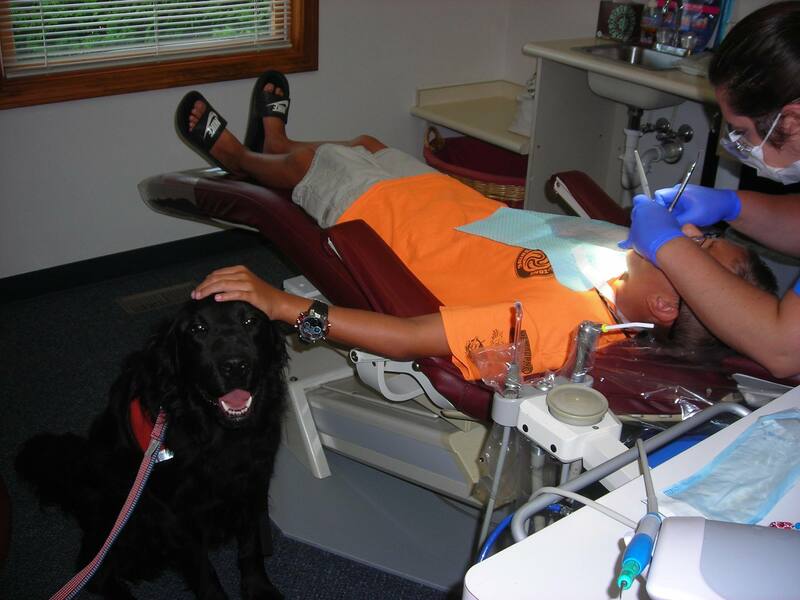 His job is to offer comfort to our patients feeling anxious about their dental appointments. He is trained to sit beside the chair and give comfort, by allowing the patient to rest their hand on his head or to put his paw or head on their lap. It has been scientifically proven that comfort from a dog lessens anxiety and blood pressure. Vern came to our office through Freedom Paws, a nationally accredited therapy dog organization. After completing several months of training and passing all tests needed to be fully certified, Vern was matched with our office based on his skills. He also went through additional training with Cindy, our office manager, and continues to have his training reinforced daily. We are very pleased to be the first and only dental office in the central Ohio area, and possibly the first in the whole state of Ohio, to offer this type of therapy for our patients. If you would like to have Vern assist you with your dental procedures, please request him when scheduling your appointment.